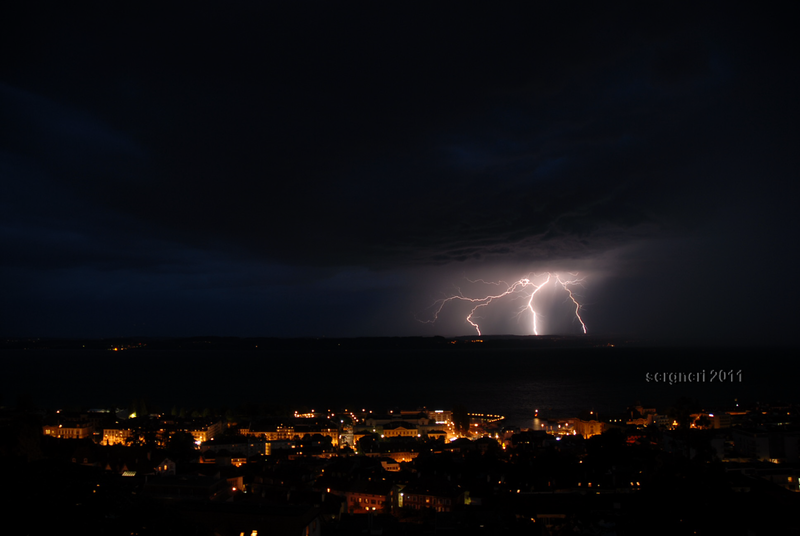 Below are time-lapse movies of the weather shot from our balcony in Neuchatel Switzerland. The camera faces south to the Alps . November 2010 to Mid-April 2011, most movies were one day in length. Due to increasing length of the day, movies made after 18 April, 2011 may cover 2 or 3 days, this allows me to leave the camera running, which is easier on my schedule. That's all from Neuchatel this year! Tuesday, 20 September 2011 Variable to 14C. Cold east wind, cousin Phil visits. Monday, 19 September 2011 Rain to 14C. Changing in late afternoon. Sunday, 18 September 2011 Rain to 12C. Autumn has arrived, cold, wet, and windy. Saturday, 17 September 2011 Variable to 20C, changing to rain. Friday, 16 September 2011 Variable to 24C. Thursday, 15 September 2011 Variable to 23C. Wednesday, 14 September 2011 Variable, sunny, to 22C. Tuesday, 13 September 2011 Variable, sunny, to 24C. Monday, 12 September 2011 Variable, sunny, to 22C. EMJ at sunset. Sunday,, 11 September 2011 Variable, sunny, then thunderstorms to 26C. Saturday, 10 September 2011 Variable, sunny , firworks to 27C. Friday, 09 September 2011 Variable, sunny, to 27C. Thursday, 08 September 2011 Variable, to 26C. Wednesday, 07 September 2011 Variable, to 26C. Tueday, 06 September 2011 Variable, to 25C. Mont Blanc and waxing moon. Sunday, 04 September 2011 Rain, to 20C. Friday, 02 September 2011 Sunny, to 26C. Thursday, 01 September 2011 Sunny, to 26C. Friday, 26 August 2011 28C dropping to 13C as an active cold front moved in. Tuesday, 23 August 2011 Sunny, to 31C. Monday, 22 August 2011 Sunny, to 31C., followed by lightning. Sunday, 21 August 2011 Sunny, to 31C. Thursday, 18 August 2011 Variable, humid, to 30C. Tuesday, 16 August 2011 Sunny for Athena's birthday, to 25C. Monday, 15 August 2011 Variable, rain to 23C. A short clip of the sunset. Sunday, 14 August 2011 Variable, to 26C. Friday/Saturday, 12-13 August 2011 Two days, variable, to 24C. Thursday, 11 August 2011 Mostly sunny, to 24C. Wednesday, 10 August 2011 Sunny, to 23C. Tuesday, 09 August 2011 Variable, to 20C. A little bit of everything, rain, sun, rainbows, moon. Monday, 08 August 2011 Variable, to 20C. Thomas' birthday. Sunday, 07 August 2011 Variable, windy to 20C. Saturday, 06 August 2011 Cloudy, rain to 22C. Friday, 05 August 2011 Variable, to 24C. Thursday, 04 August 2011 Variable, to 26C. Tuesday, 02 August 2011 Sunny, to 26C. Sunday, 31 JULY 2011 Variable, to 24C. Saturday, 30 JULY 2011 Variable, to 22C. Friday, 29 JULY 2011 Variable, to 22C. Thursday, 28 JULY 2011 Variable, to 22C. Wednesday, 27 JULY 2011 Variable, to 20C. Tuesday, 26 JULY 2011 Variable, to 18C. Monday, 25 JULY 2011 Variable, to 16C. Sunday, 24 JULY 2011 Variable, to 15C. Saturday, 23 JULY 2011 Variable, light rain to 19C. Friday, 22 JULY 2011 Mostly cloudy, heavy rain to 15C. Thursday, 21 JULY 2011 Mostly cloudy to 14C. Wednesday, 20 JULY 2011 Mostly cloudy to 15C. Tuesday, 19 JULY 2011 Mostly cloudy to 15C. Monday, 18 JULY 2011 Variable, sunny to 18C. Sunday, 17 JULY 2011 Heavy rain to 16C. Saturday, 16 JULY 2011 Variable, sunny to 23C. Beautiful moon over the lake. Friday, 15 JULY 2011 Variable, sunny to 20C. Thursday, 14 JULY 2011 View from my atelier window, 1 minute 30seconds. Tuesday, 12 JULY 2011 Variable, humid to 31C. Monday, 11 JULY 2011 Variable, sunny to 26C. Sunday, 10 JULY 2011 Variable, thunderstorms AM, clearing in afternoon. to 22C. Saturday, 09 JULY 2011 Variable, sunny to 28C. Friday, 08 JULY 2011 Variable, sunny to 24C. Thursday, 07 JULY 2011 Variable, to 23C. Wednesday, 06 JULY 2011 Variable, sunny to 26C. Tuesday, 05 JULY 2011 Variable, sunny to 27C. Monday, 04 JULY 2011 Variable, sunny to 26C. Sunday, 03 JULY 2011 Variable, sunny to 25C. Saturday, 02 JULY 2011 Variable, sunny to 24C. Celebrate Deirdre's and Andrew's birthdays and commorate Gildo's funeral. Friday, 01 JULY 2011 Variable, sunny to 22C. Thursday, 30 JUNE 2011 Variable to 22C. Wednesday, 29 JUNE 2011 Cold front moves in, 30C to 21C. Monday and Tuesday, 27 - 28 JUNE 2011 Sunny to 33C. Sunday, 26 JUNE 2011 Sunny to 28C. There appears to be 3 sunsets on the mountains. Saturday, 25 JUNE 2011 Variable, sunny to 24C. Friday, 24 JUNE 2011 Variable, to 20C. In memory of Gildo. Thursday, 23 JUNE 2011 Variable, sun and rain to 24C. Wednesday, 22 JUNE 2011 Variable, sun to 27C. Tuesday, 21 JUNE 2011 Variable, sunny to 28C. Monday, 20 JUNE 2011 Variable, windy to 24C. Sunday, 19 JUNE 2011 Variable, wind and rain to 16C. Saturday, 18 JUNE 2011 Rainbows for Amelia, variable, sun and rain to 14C. Friday, 17 JUNE 2011 Variable, sun and rain to 15C. Thursday, 16 JUNE 2011 Variable, sun and rain to 24C. Wednesday, 15 JUNE 2011 Variable, sun and rain to 23C. Tuesday, 14 JUNE 2011 Variable, sun to 22C. Monday, 13 JUNE 2011 Variable, rain to 17C. Friday, 10 JUNE 2011 Variable to 17C. Thursday, 09 JUNE 2011 Rainy to 15C. Wednesday, 08 JUNE 2011 Rainy to 17C. Monday, 06 JUNE 2011 Variable to 21C. Sunday, 05 JUNE 2011 Variable to 23C. Saturday, 04 JUNE 2011 Variable to 23C. Thursday and Friday, 02 - 03 JUNE 2011 Unsettled to 18C. Wednesday, 01 JUNE 2011 Rain to 11C. May 2011 in descending order, newest to the oldest. Tueday, 31 MAY 2011 Rain, high of 21 dropping to 11C. Monday, 30 MAY 2011 Sunny to 28C., evening thunderstorms, extra clip included or you can see the lightening clip here. Also 3 high resolution png files here , here, and here. Sunday, 29 MAY 2011 Sunny to 24C. Saturday, 28 MAY 2011 Sunny to 20C. Thursday, 26 MAY 2011 Changing, thunderstorms, humid, to 28C. Wednesday, 25 MAY 2011 Sunny, windy, to 28C. Tuesday, 24 MAY 2011 Sunny, to 27C. Monday, 23 MAY 2011 Variable, sunny to 24C. Sunday, 22 MAY 2011 Variable, thunderstorms, to 22C. Saturday, 21 MAY 2011 Variable, sunny, to 23C. Friday, 20 MAY 2011 Variable, sunny, to 23C. Thursday, 19 MAY 2011 Moon rise over lake then variable, sunny, to 25C. Wednesday, 18 MAY 2011 Variable, sunny, to 21C. Tuesday, 17 MAY 2011 Variable, sunny, to 18C. Monday, 16 MAY 2011 Variable, sunny, to 16C. Sunday, 15 MAY 2011 Variable with rain, cooler to 15C. Saturday, 14 MAY 2011 Stormy with rain, cooler to 16C. Friday, 13 MAY 2011 Variable, clearing to sunny, warm to 21C. Thursday, 12 MAY 2011 Variable, rain today (15mm) and cooler, to 16C. Wednesday, 11 MAY 2011 Variable to 26C, some thunder and rain. Tuesday, 10 MAY 2011 Variable to 25C, some rain. Monday, 09 MAY 2011 Mostly sunny to 25C. Sunday, 08 MAY 2011 Variable to 25C, mostly sunny. Happy Mothers day to Deirdre, sisters Susan, Theresa, and Gilda, mother Bev, and Mariana! Saturday, 07 MAY 2011 Variable to 22C, mostly sunny. Friday, 06 MAY 2011 Variable to 22C, mostly sunny. Thursday, 05 MAY 2011 Variable to 21C, mostly sunny. Wednesday, 04 MAY 2011 Variable to 20C, mostly sunny. Monday, 02 MAY 2011 Variable to 17C. 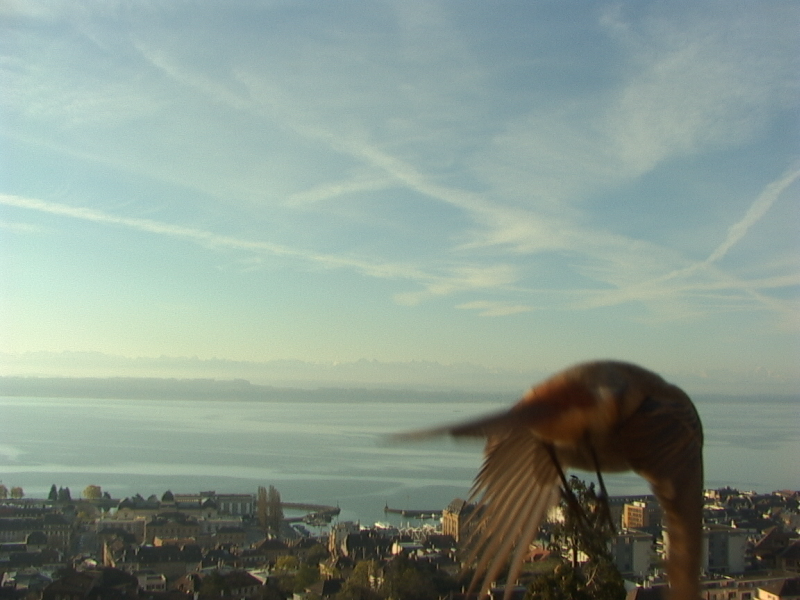 The swallows have returned to Neuchatel. 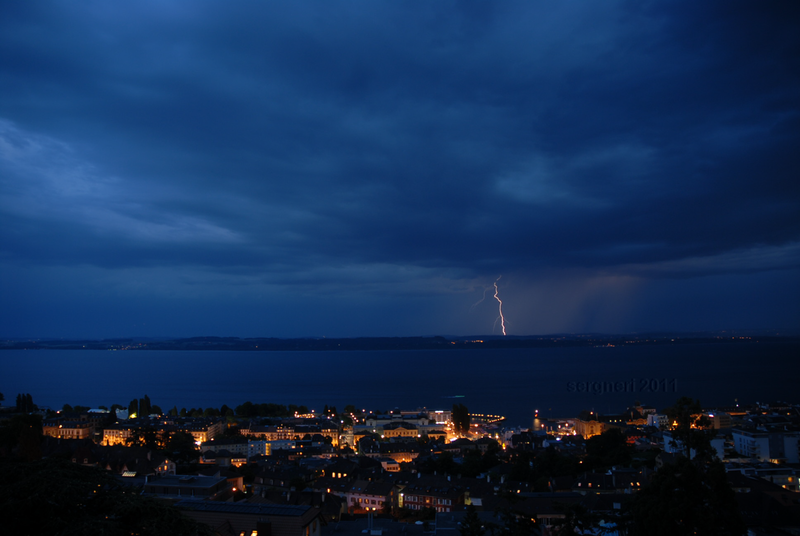 May 1, 2011 From the port looking north at thunderheads over the Jura behind Neuchatel. Sunday 01 May, 2011 Variable to 20C. April 2011 *in descending order, newest to the oldest. Hi speed Saturday, 30 April to Sunday 01 May, 2011 Variable to 20C., two days combined. Slowed down .5x Saturday, 30 April 2011 rendered in single day. Hi speed Thursday, 28 April to Friday 29, 2011 Variable to 18C. two days combined. Slowed down .5x Thursday, 28 April or Friday 29, 2011 rendered in single days. Tuesday, 26 April to Wednesday 27, 2011 Variable to 18C. 01m 54s. Easter Sunday, 24 April to Monday 25, 2011 Variable to 25C. 01m 50s. Friday, 22 April to Saturday 23, 2011 Variable to 26C. 01m 48s. Tuesday, 19 April to Thursday 21, 2011 Warm to 28C. 02m 59s. Monday, 18 April 2011 Clear, 21 C.
Sunday 17 April 2011 Clear, 20 C.
Friday 15 April 2011 Clear, strong bise, 12 C.
Thursday 14 April 2011 Variable high clouds, 12 C.
Wednesday 13 April 2011 Clear to variable high clouds, 12 C.
Tuesday 12 April 2011 Cold front moves through, highs to 14C. Friday, 08 to Monday, 11 April 2011 Warm to 28C. This video spans 4 days and runs 02m 33s. Thursday, 07 April 2011, Clear, to 24 C. Forecast is for more of the same for the next 3 days. I will upload new video if the weather changes or warrents an update. Tuesday, 05 April 2011, Clear to 16 C., a PNG of the frame with the bird here, a PNG of sunset on Mt. Blanc here . Monday, 04 April 2011, Variable to clearing, to 13 C.
Sunday, 03 April 2011, Clear changing to light rain, to 22 C.
Saturday, 02 April 2011, Clear, lake level fog to 25 C.
Thursday, 31 March 2011, Variable changing to rain. 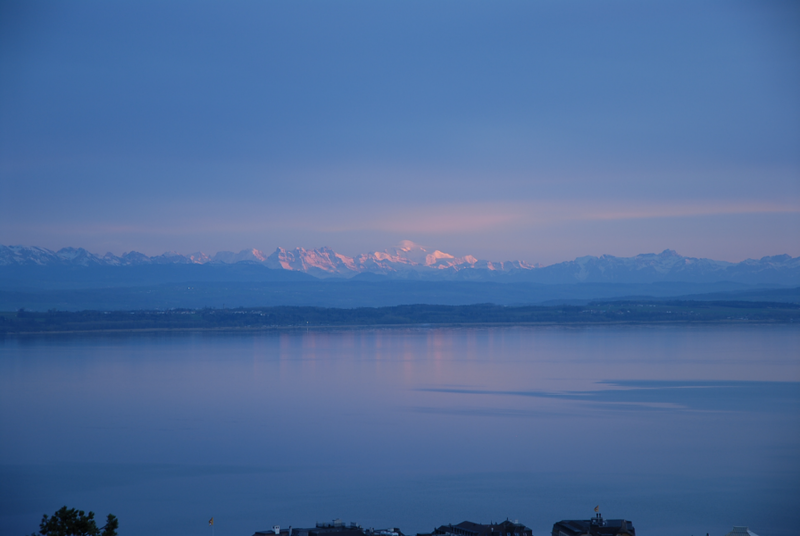 11 C.
Wednesday, 30 March 2011, Short video of the sunset over the Alps. Tuesday, 22-MAR-2011, Moon and a clear day to 12 C.
Monday, 21-MAR-2011, Spring equinox, Clear to 10 C, no video. Sunday, 20-MAR-2011, Clear to 9 C strong wind from the east, Bise. Saturday, 19-MAR-2011, Overcast to 9 C falling to 5 C in late afternoon. Friday, 18-MAR-2011, Sun to 13 C.
Thursday, 17-MAR-2011, Overcast, some rain, 10 C.
Wednesday, 16-MAR-2011, Variable changing to rain, 12 C.
Sunday, 13-MAR-2011, Cloudy, 11 C.
Saturday, 12-MAR-2011, Clear to cloudy, 11 C.
Friday, 11-MAR-2011, Sunny, 15 C.
Thursday, 10-MAR-2011, Variable to Sunny, 15 C.
Wednesday, 09-MAR-2011, Sunny and warm to 14 C.
Tuesday, 08-MAR-2011, Sunny and calm to 13 C.
Saturday, 05-MAR-2011, Milky and windy to 9 C.
Friday, 04-MAR-2011, Sunny to 7 C.
Thursday, 03-MAR-2011, Sunny to 4 C., strong bise. Wednesday, 02-MAR-2011, Stratus burns off (finally! ), mostly sunny to 4 C., the bise is back. New video from archives, Thursday, 28-OCT-2010, Clear and calm sunset on the Bernese Oberland. 13 C.
Sunday, 27-Feb-2011, Variable overcast, Juran, to 6 C.
Saturday, 26-Feb-2011, Variable overcast, to 6 C.
Friday, 25-Feb-2011, Morning fog clearing to sunny afternoon, to 7 C.
Thursday, 24-Feb-2011, Snow and rain to 2 C.
Wednesday, 23-Feb-2011, Sunny with light cover to 3 C.
Tuesday, 22-Feb-2011, Cloudy with some sun to 3 C.
Monday, 21-Feb-2011, Cloudy with some sun to 3 C.
Saturday, 19-Feb-2011, Morning haze, some sun, to 5 C.
Friday, 18-Feb-2011, Morning haze with sun, to 7 C.
Thursday, 17-Feb-2011, Haze with partial clearing, to 6 C.
Wednesday, 16-Feb-2011, a very gray day, stratus at lake level all day, to 4 C, no video. Tuesday, 15-Feb-2011, Rain to partial clearing, to 7 C.
Monday, 14-Feb-2011, Sunny, barometer falling, 1 to 12 C. Occluded front moving in from west tonight. Sunday, 13-Feb-2011, Sunny, barometer begins to change, 1 to 15 C.
Saturday, 12-Feb-2011, Sunny and very pleasant, 1 to 16 C.
Friday, 11-Feb-2011, Warm trend continues, sunny and very pleasant, 1 to 14 C.
Thursday, 10-Feb-2011, Warm trend continues, sunny and very pleasant, 1 to 12 C.
Wednesday, 09-Feb-2011, Warm trend continues, sunny and very pleasant, 1 to 12 C.
Tuesday, 08-Feb-2011, Warm trend continues, sunny and very pleasant, 1 to 12 C.
Monday, 07-Feb-2011, Sunny and very pleasant, 1 to 12 C.
Sunday, 06-Feb-2011, Sunny and very pleasant, to 12 C.
Saturday, 05-Feb-2011, Sunny and very pleasant, to 12 C.
Friday, 04-Feb-2011, Variable to mostly sunny to 8 C.
Thursday, 03-Feb-2011, Stratus 0 to 2 C, small change to warmer temperatures. See 31DEC2010 for an almost exact copy of today. Sunday, 09-Jan-2011, Variable changing to rain to 6 C. Venus anyone? Monday, 10-Jan-2011, Variable to 5 C.
Tuesday, 11-Jan-2011, Variable to 4 C., windy. Sunbeams in the morning. Wednesday, 12-Jan-2011, Variable, rain to 6 C.
Thursday, 13-Jan-2011, Variable, rain to 10 C. or with a little accordian music here. Friday, 14-Jan-2011, Variable, sun to 10 C. or with a little accordian music here. Saturday, 15-Jan-2011, Sun to 15 C. or with a little accordian music here. I stopped counting contrails after I hit 100 at roughly noon on the 15-JAN-2011 video. How many do you see? Sunday, 16-Jan-2011, fog rising in the morning or with a little music here. Sunday, 16-Jan-2011, Fog and sun battle it out, to 8 C.
Monday, 17-Jan-2011, Fog and sun battle it out again, to 6 C.
Tuesday, 18-Jan-2011, Heavy fog, a few short breaks late in the clip, to 3 C.
Thursday, 20-Jan-2011, Snow and some sun, to 1 C.
Friday, 21-Jan-2011, Sunny with a strong cold wind, to 0 C.
Saturday, 22-Jan-2011, Mostly sunny with a strong cold wind, to -1 C.
Sunday, 23-Jan-2011, Mostly sunny with a cold wind from the east, to -1 C.
Monday, 24-Jan-2011, Mostly sunny, less windy but still cold to -1 C.
Tuesday, 25-Jan-2011, Mostly sunny, wind from west, to 3 C.
Wednesday, 26-Jan-2011, Variable to 6 C.
Thursday, 27-Jan-2011, Variable to 4 C.
Friday, 28-Jan-2011, Mostly cloudy to 2 C.
Saturday, 29-Jan-2011, Mostly sunny to 2 C.
30, 31 JAN 2011, the fog is back, it is cold and very, very boring for time-lapse. 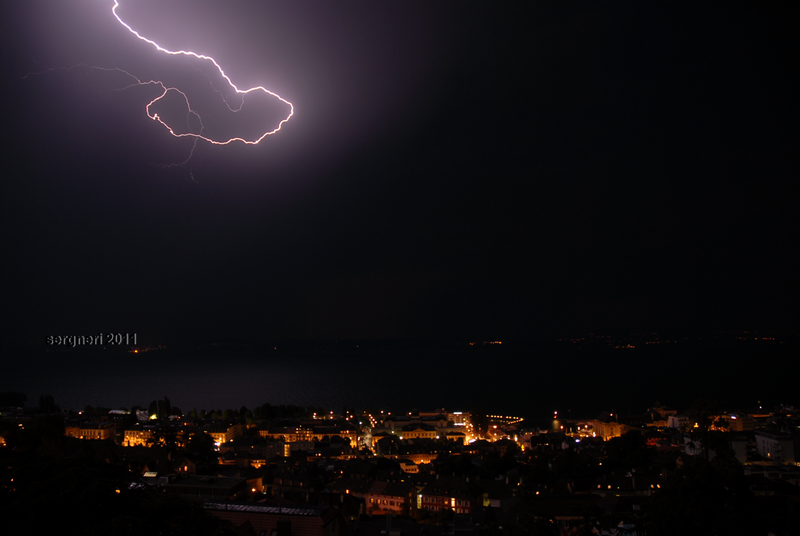 I will update as soon as this trend changes, but in Neuchatel, it could last for days. Wednesday, 01-Dec-2010, Snow, -4 to -1 C or 800 px with VDUB here. Tuesday, 07-Dec-2010, Variable to 10 C or resampled with audio here. Wednesday, 08-Dec-2010, Variable to 10 C or for Mos and Nico here. Thursday, 09-Dec-2010, Sunny to 3 Cor for a slower lapse here. Friday, 31-Dec-2010, More Fog, 1 to 2 C Happy New Year! Saturday, 13-Nov-2010, Mont Blanc clear day - half as fast 6 FPS or full speed 15FPS here. Sunday, 14-Nov-2010, clear day, 21 C or rendered with Vegas10 here. Monday, 15-Nov-2010, raining 6 C or rendered with Vegas10 here. Thursday, 25-Nov-2010 Foehn, Variable, 2 C. New, redone video (recommened) or 30 FPS (Fast) . Fog at sunrise, Neuchatel, 2006. JUL 2005, Time-lapse of clouds in window, made with Nikon Coolpix. 09-FEB-2008, Contrails and Sunset reworked with less compression. 02-AUG-2008, Summer day on Lake Neuchatel. 20-JAN-2008, Sunset over Lake Neuchatel. 03-FEB-2009, Sunrise over Lake Neuchatel. JAN 2007, Seattle skyline daytime. The camera is set to record 1 frame (still at 1078x800) per minute to a 4 GB chip. In the evening, I shut off the camera and remove the chip, plug it into the PC, delete the 500+ shots from the previous night, and move all the remaining files to a network drive. I reset the chip and camera for the next day. Using Sony VEGAS 10, open a project set to 640x480, square pixels format. I import the stills as a clip then put the clip in the editor. I set the properties -> playback rate to 0.25, as slow as it can go. I then render this to a local hard disk as an AVI. Using Flix Standard, I open the AVI and encode it to a SWF file using VP6-E preset for CBR streaming at 872 kbs. The daily HTML is copied from the day before and lightly edited and saved as new by date. The main weather page index is the same file, lightly edited. I upload the the SWF, 1 new and 1 edited HTML file to the website. All this takes about 20 minutes per night, it has become a ritual after dinner. If you have questions use the contact link above. Moved to HTML5: In March 2017, I transcoded all the SWF files to MP4 using HANDBREAK in batch mode. If you see a video which doesn't work, please send me a note at the contact link above. roundtrip is 80 min. From April 1, a boat arrives at 16:00, departs at 16:15 on weekends.